Kabul: History has fostered a notion here that all foreign occupations of Afghanistan are ultimately doomed. There was the catastrophic retreat of a British expeditionary force in 1842. Nearly 150 years later came the Soviet troop withdrawal of 1989. Now, with the Taliban pressing in on this city and dominating the countryside, there are fears that this occupation, too, will eventually fail. Cairo, once a debonair lawyer in his native Turin, Italy, is almost certainly the most celebrated Western relief official in Afghanistan, at least among Afghans. To the generation that has benefited from his relief work for the International Committee of the Red Cross, he is known simply as “Mr Alberto," a man apart among the 15,000 foreigners who live and work in this city. That total includes civilians working for embassies or foreign relief agencies, like Cairo, and troops from 41 nations fighting to hold the line against Al Qaeda and the Taliban. In Afghanistan’s turbulent history, there have rarely been as many foreigners living in Kabul, the Afghan capital, nor as much riding on what they achieve. Cairo, 56, arrived long before the vast majority of them, in 1990, after the Soviet occupation. He had transferred from a Red Cross posting in Africa to run the orthopedic rehabilitation programme of the organization—a job dedicated to helping Afghans disabled by war injuries to live normally again, by equipping them with artificial legs and arms. What the Red Cross centres have accomplished is visible on the streets of almost every Afghan town and village. 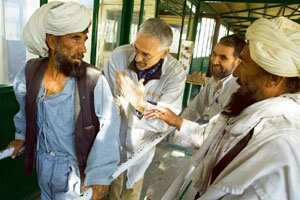 Since the Red Cross started the programme in 1988, the centers have provided prostheses to nearly 90,000 Afghans. Many Red Cross patients were victims of the 10 million mines strewn across the landscape during the Soviet period. Cairo, slim, affable and an energetic enthusiast of tennis, rarely shows the edginess that wears away at the most courtly of foreigners under stress in foreign lands. But a rare impatience shows when people who know what he has accomplished suggest he has become a legend. Rather, Cairo says, it is he, more than his patients, who has been the greatest beneficiary of his years in Kabul. His passion took root the moment he arrived. Not long before, he had abandoned law and retrained as a physiotherapist, seeing it as a path to a more fulfilling life. Now, he says, he cannot imagine another life. “When I’m away from Afghanistan, I can’t think of anything but what I have here," he said during a pasta dinner he cooked at his Kabul home. Continuing in English, which he speaks fluently and mixes, when among Afghans, with a strong working command of Dari and Pashto, Afghanistan’s two principal languages, he added: “Whenever I go to Europe, I worry that for some reason I won’t be able to come back. What I’m doing here is so rewarding. For me, it's perfect." The Kabul rehabilitation center is a spacious complex built on an old hospital graveyard in northwestern Kabul. It was assigned to the Red Cross by President Najibullah, the Afghan leader during the last years of the Soviet occupation who was lynched by the Taliban in 1996. In the traditions of the Red Cross, the centres make no distinction on the basis of political affiliation. Asked whether disabled Taliban fighters were at the centres, Cairo replied: “I hope so. We ask for a name when our patients register, but they can give any name, and we don’t investigate." In practice, many new patients treated at the centres now, about 6,000 a year, are not war casualties, or even victims of the mines. Instead, many of the new patients are being treated as a result of circumstances not related to war: car accidents, congenital deformities, or the effects of polio or tuberculosis. But the legacy of past fighting and the injuries inflicted in the current conflict—in which both Taliban and coalition forces have caused civilian casualties—keep the centres busy. Of the 90,000 people who have received new limbs, 70,000 revisit the centres every year, usually to replace or readjust their prostheses. All the treatments, including overnight stays, are free. Cairo’s passion for his patients is reciprocal, and nowhere is that more evident than out on the Kabul center's open-air testing ground, where men, women and children, some standing for the first time in years, learn to walk again. Tears flow readily, and much of the gratitude flows to “Mr. Alberto". Shah Mohammed, a 25-year-old policeman who lost a leg this year to a bomb buried by the Taliban, waited in a wheelchair. The Americans? “It is better that they should be here, because of the Taliban," he said. And the Taliban? “If I find them, I’ll put them in a grinding machine." He paused, and turned to something more immediate. “Mr. Alberto," he said. “We love him. Please put that down. We love him."